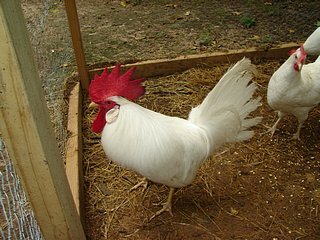 leghorn Chickens are a popular chicken breed that are early to mature and are excellent layers of large eggs. Size: Standard Male: 6 Ibs. / Standard Female: 4.5 Ibs. Bantam Male: 26 oz. / Bantam Female: 22 oz. Comb, Wattles & Earlobes: Red wattles and white earlobes, unless otherwise noted. Male: Medium length, well rounded wattles with broad oval earlobes close to head. Female: Medium sized wattles with oval earlobes that are close to the head. Color: Additional varieties, such as cuckoo and mottled, are recognized outside the United States, but not by the APA or ABA at this time. Beak, shanks, and toes are yellow, unless otherwise noted, with red eyes. Barred: Both single and rose comb varieties with standard barred plumage. Black: Both single and rose comb varieties with standard black plumage. Black-Tailed Red: Single comb. Beak is yellow but may be tinged in reddish horn. Standard black-tailed red plumage. Blue: Single comb. Standard blue plumage. Buff: Both single and rose comb varieties with standard buff plumage. Buff Columbian: Both single and rose comb varieties with standard buff Columbian plumage. Columbian: Both single and rose comb varieties with standard Columbian plumage. Dark Brown: Both single and rose comb varieties with standard dark brown plumage. Dominique: Rose Comb only. The feathers are barred in black and creamy white over the entire body. Males may be a shade lighter than females. Under color for both is slate. Exchequer: Both single and rose comb varieties with white and black, fairly distributed across the body. Golden: Single comb with standard golden plumage. Light Brown: Both single and rose comb varieties. Beak is horn colored with standard light brown plumage. Mille Fleur: Single comb only with standard Mille Fleur plumage. Red: Single comb only with red plumage. Silver: Both single and rose comb varieties with standard silver plumage. White: Both single and rose comb varieties with standard white plumage. Special Qualities: Early to mature and an excellent layer of large eggs. Leghorns Chickens are one of the few breeds that actually have the distinction of being imported into North America twice. They came straight from their native Italy as early as 1830 before they made it to Great Britain. They then came back to the U.S. via Britain in the 1870's. It is believed that the first imported birds died out sometime between the 1830's and the 1870's. 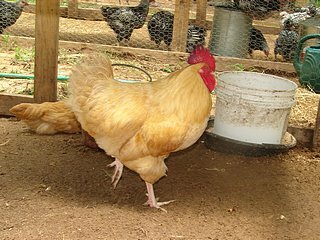 Leghorns have long been one of the most popular in the world due to their exceptional egg laying abilities, their adaptability to confinement or free range, and their hardiness. They have more varieties recognized by the APA and ABA than any other breed, which says a lot for their popularity. These birds lay large white eggs and have one of the best feed to egg ratios of any pure breed. Leghorn Chickens were first recognized by the APA in 1874.